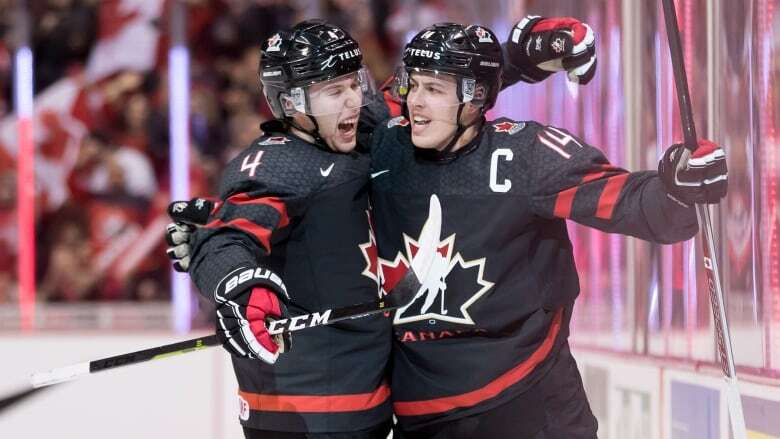 Taking inspiration from the announcing at a UFC mixed martial arts card, Canada's team captain Max Comtois introduced the "main event" at the top of his voice in an effort to pump up the group prior to a 14-0 win over Denmark to open the tournament. Max Comtois' teammates were stunned on Boxing Day when he started screaming in the tunnel before Team Canada took the ice in their first game of the world junior hockey championship. "I didn't know what was going on. I look behind and it's just Max yelling and everyone was just kind of shocked," said centre Shane Bowers. Taking inspiration from the announcing at a UFC mixed martial arts card, the team captain introduced the "main event" at the top of his voice in an effort to pump up the group. Canada routed Denmark 14-0 in that game, then went on to win their next two round-robin match ups. Comtois' booming ritual has continued and it's one the other players have come to expect. "You kind of see him come out and it's only a matter of seconds until he starts chanting. Now it's just kind of a routine that's been having success so I think he's just going to keep it going," Bowers said. "I think the guys get a good kick out of it." Comtois, the only returning player from last year's gold medal-winning team, said he's just trying to get his teammates fired up before they hit the ice. "Maybe it helps but ... we have a good mindset and everyone's on board right from the start. It's good to have that," said the Anaheim Ducks prospect. A video of Comtois' dramatic pre-game introductions caught the attention of UFC announcer Bruce Buffer on Monday. "Very cool," he tweeted, followed by a series of emojis. Comtois smiled when he heard the news. "That means I'm doing a good job," he said. "So I'll take that." Team Canada coach Tim Hunter is also impressed with how the 19-year-old left-winger has performed this year. The coaching staff tasked him with working on his maturity after last year's tournament and the young athlete stepped up, Hunter said. "Right from the gritty things to getting guys ready in the activation before they get dressed, going out and managing warmup, getting them settled down after warmup then getting them charged up before they go out. He's played like a leader, he's led by example," Hunter said. "It's impressive and that's why he's the captain of our team." Comtois isn't the only player with a pre-game routine. Centre Jaret Anderson-Dolan and defenceman Ty Smith play rock-paper-scissors before hitting the ice. The winner buys coffee the next morning. Anderson-Dolan, one of Canada's assistant captains, isn't sure how the ritual began but said it's long running. "We just got into it one day and I think we played well that game," he said. "And ever since, we've just done it every day." The L.A. Kings prospect has a few wins in a row on Smith, but said the record is "all over the place." "It's just a fun thing, keeps us loose before games," he said. Hunter said he warned his players that he wouldn't be responsible for pre-game prep. "That's the one thing I told them — I'm not a cheerleader," he said. "I'm not going to get you revved up before the game but you've got to yourself in an emotional spot where you're prepared to compete and you're not over the line."